Extreame Savings Item! 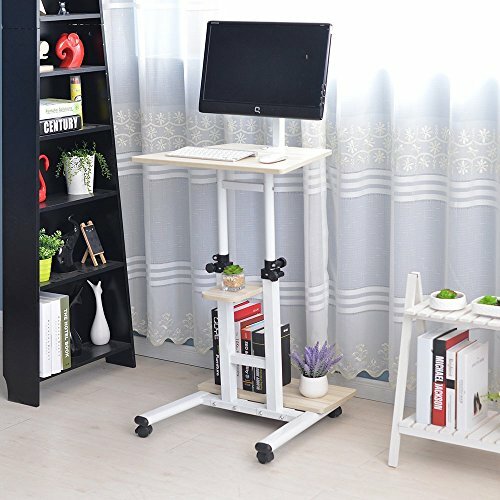 Save 42% on the Soges Adjustable Standing Desk Stand up Desk on Wheels Computer Desk Workstation with Wheels Moving Desk, White Maple XG01-03 by soges at The Daily Codex. MPN: XG01-03. Hurry! Limited time offer. Offer valid only while supplies last. Overall size: 23.2 Width x 18.1 D x 28- 43.3 H inch, easily moves everywhere you want. All-in-one compact design, you can put whole set of desktop on it with CPU holder. Single monitor mount included, which can tilt your monitor up 25 degrees and down 25 degrees with a combined 360 degree landscape to portrait rotation. Ergonomic height adjustable station from sitting to standing position, reduced back and neck pain, provides a healthy working way. Environmental particle wood, waterproof and anti scratch; Heavy-duty powder-coated metal which ensures stability and durability. If you have any questions about this product by soges, contact us by completing and submitting the form below. If you are looking for a specif part number, please include it with your message. Flexispot Adjustable Computer Mount | Under Desk CPU Mount 180-degree Swivel CPU Holder | Desk and Floor Space Saving.